There is nothing permanent or changeless in this world. Time influences everything and everyone. We don’t usually pay attention to things changing as it happens so slowly, but some changes are really surprising. votreART brings you some pictures of unbelievable examples of time’s work on things and people. Look through them to the end to get to know what time can do in a few months and over hundreds of years. 1. These are the footprints of a monk made by him praying in the same spot for decades. 2. Here’s 6 months worth of buildup in a pipe used for a mineral pool spa. 3. This entire brick wall has been shaped by the sea. 5. Before and after powerwashing. New York used to be a much dirtier city back when the Northeast ran on coal plants. 6. 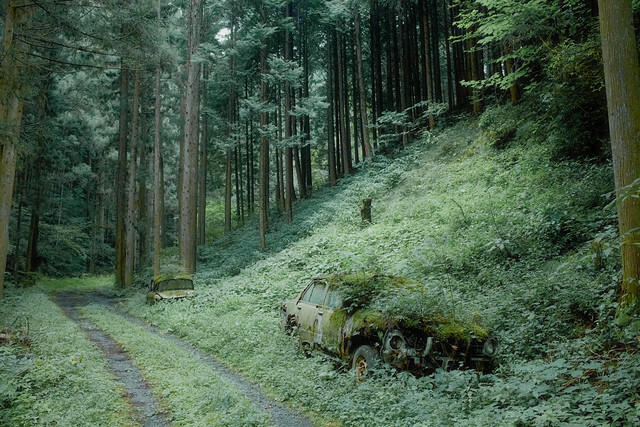 2 cars were left in the woods many years ago. 7. 2 identical teddy bears. The one on the left has been my brother’s for 30 years; the one on the right has been kept in storage for my brother’s first child who was born today. 11. One pillowcase has been used nearly every day for 40 years. The other has been in a closet. 12. These M&M’s have been sitting in there for over 10 years. 13. Iron Chef Morimoto’s knives. The top one is a new knife. The bottom one shows 3 years of use, sharpening, and cleaning at his restaurant. 14. This can has been sitting in that cup holder for over 2 years. 17. This parking lot used to be some sort of building. Instead of removing the old tile floor, they simply paved over it. 18. This tree is holding up stones from a collapsed wall. 19. This exterior corner next to the front door of the local bike shop shows significant wear from the last 30 years of customers striking it with their pedals. 20. A boy left his bike chained to a tree when he went away to war in 1914. Which picture impressed you the most? Tell us what you think in the comments.